When my pal Steve Pitts rang me and asked whether I "fancied a trip to Cape Cod," on the east coast of the USA I was intrigued. My only previous visits to the United States have been brief 'stopovers' on the way to other places, so I had no idea what to expect. 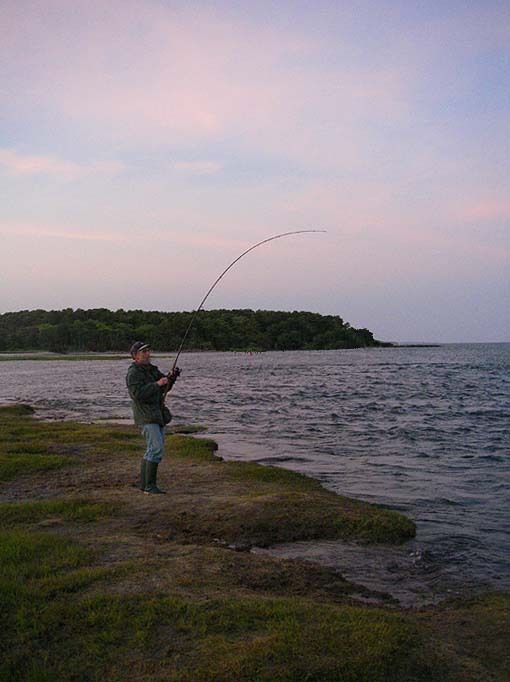 The only thing I knew about the Cape was that there were lots of towns and villages with English names (Wareham, Dorchester, Weymouth, Plymouth, etc., etc..) and that it was the haunt of striped bass and bluefish. Anyway, I always enjoy fishing trips with Steve so I said "Yes!" We persuaded our pal Alan Vaughan to join us (he didn't need much arm twisting) and began to gather information about the place. 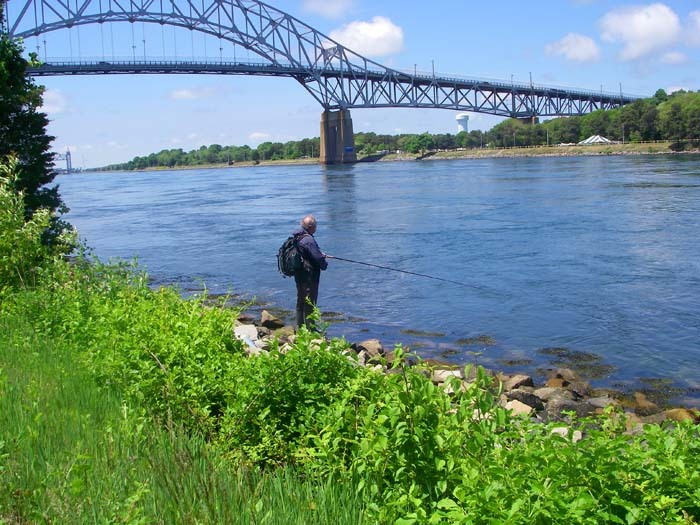 We are all members of the 'Bass Anglers Sportfishing Society' and several of our friends in the group regularly take their holidays in Montauk and Cape Cod in search of stripers so we were inundated with advice. None of us had ever caught the target species before so we were all 'rarin to go'. Apparently May-June is the key time for the Cape, as the bass move north on their annual migration, so flights, house and car were booked to cover ten days beginning in the last week in May. Everything went more or less without a hitch. We arrived in Boston with suitcases bulging with lures (far too many), rods and reels. 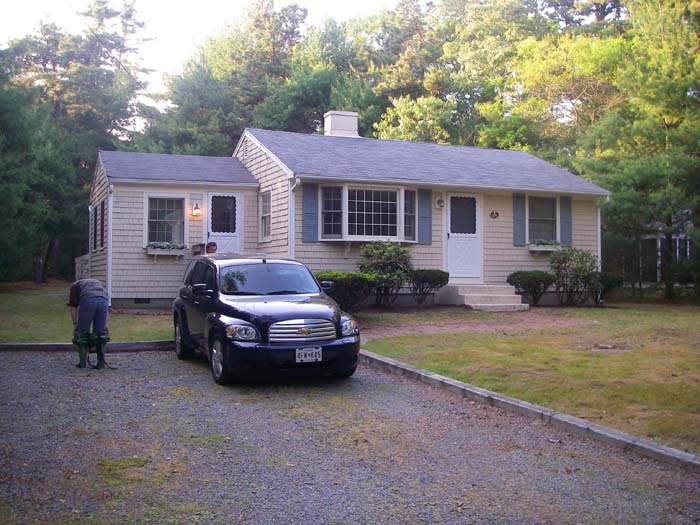 We piled into the hire car and Steve drove us to our rented house. The Cape is thickly covered with mixed woodland of small trees such as oaks, Robinia and pines. Neatly shingled wooden houses, mostly painted pale grey, are dotted among the trees. The coast itself consists of long sandy beaches backed by dunes covered in marram grass, strongly scented pink and white roses and magenta coloured sea peas. There are countless inlets and small islands. 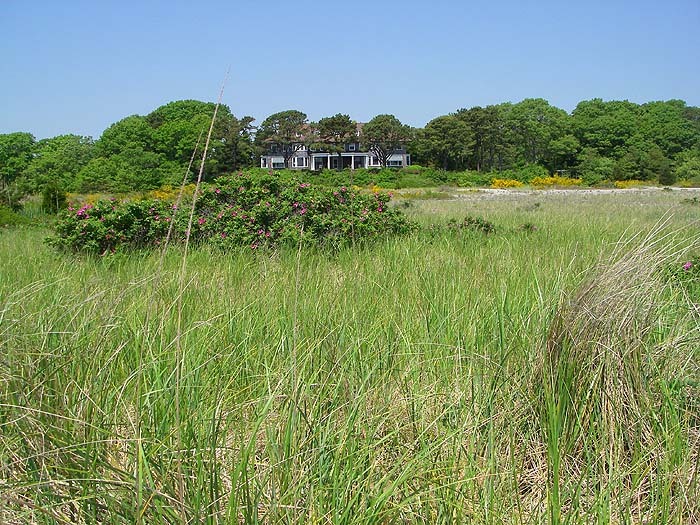 The narrow necks between sand spits, salt marshes and dunes channel the tides into rushing rivers which reverse twice a day and these are the places where the bass and bluefish hunt their prey. It is these 'torrents' of salt water which you must learn to fish if you are to catch them. The regulations include a two fish bag and a 28" size limit on stripers. Parking at the coast is often a bit of a nightmare unless you have a permit from the local authority. While we were there it was generally very warm and sunny so that trudging the miles of sandy beach in chest waders could be a bit of an ordeal. However, the weather was pretty changeable during our short stay and we experienced strong winds, thick mist, thunder storms and (mostly) calm, blazing hot, afternoons. There is lots of 'wildlife including squirrels, chipmunks, possums, skunks and raccoons (we saw most of them). A huge variety of birds provide a noisy dawn chorus and there are red tailed hawks and ospreys soaring over the trees and bays. 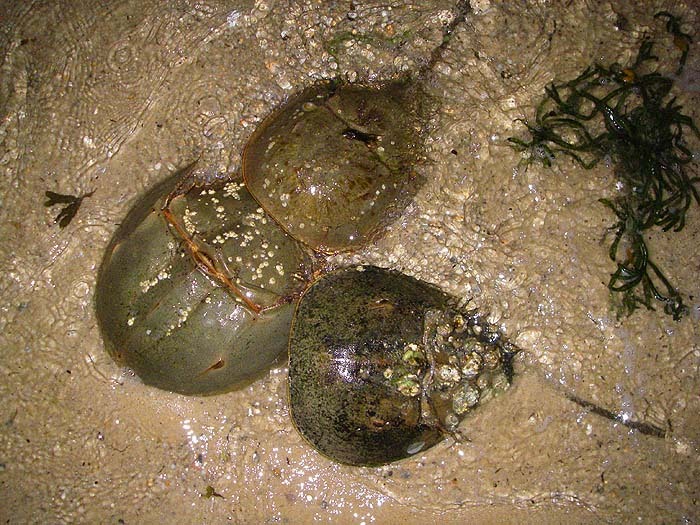 The sea was alive with clams, crabs, horseshoe crabs, baitfish and comb jellies, all potential food for the larger fish. "Get on with it Ladle," I hear you say. Never mind the scenery, what about the fishing? Well, whatever you have read or been told nothing really prepares you for the real thing. 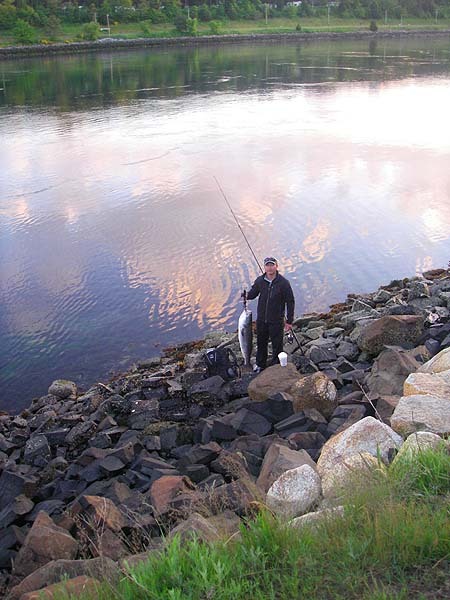 On our first evening we were down at the sea jigging soft plastic shads in the fast flow of deep water. It's a tricky business. The idea is to get the lure down to the sea bed (mostly free of weed and obstructions) and twitch it in front of the foraging bass. 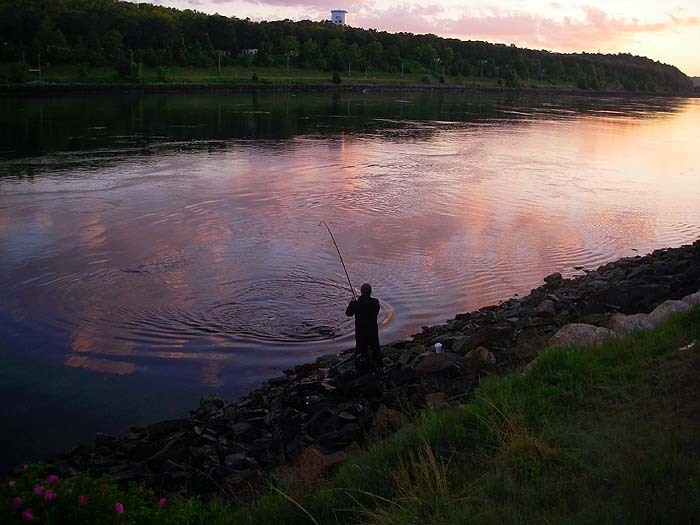 Easier said than done, although some of the local anglers have it down to a fine art. I watched one 'master of the jig' land no less than fourteen good (10lb-ish) bass in the space of a couple of hours while, around him, a group experienced BASS members struggled to winkle out just one or two between them from the same stretch of water. A noted 'hotspot' is The Canal. This huge, man-made channel winds its way across the Cape and allows ships quick access from one side to the other. The bass have twigged that they can also nip through the artificial channel and it is a place that consistently produces big fish for those in the know. We tried to fish the Canal on a couple of mornings without getting a sniff but were given a bit of a master class by another local angler in the process. That's fishing I'm afraid! You're never too old to learn. In the course of our ten day stay we gained a vast amount of experience and we did catch plenty of fish. I'll say a bit more about the whys and wherefores next time, so watch this space. How's that for a bass?